Home Knife Collecting A Custom Gentleman’s Takedown Combat Utility Knife? The Tuxedo Fighter by Tim Steingass is a takedown combat utility knife the maker quipped is for guys “who like Tinkertoys®”—those who enjoy taking their knives apart and putting them back together. As for the Tuxedo name, Tim said he got the idea for it from one of his customers for whom he made repros of three Bob Loveless small fighters. The fact that the fighter is small and fancy also seemed to fit the Tuxedo moniker. 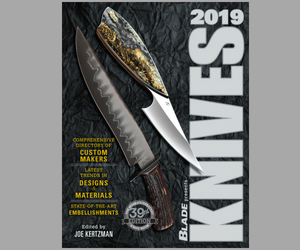 “It’s not tactical, it has a shiny blade and beautiful, shiny handle, and all the fittings are polished and pretty and it comes with a horizontal, ambidextrous sheath,” Steingass added.